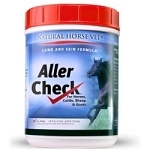 Our Aller Check supplement provides the added targeted support needed to help your horse maintain a healthy immune system when battling any allergic-type condition. It is great for those seasonal allergies or year round. 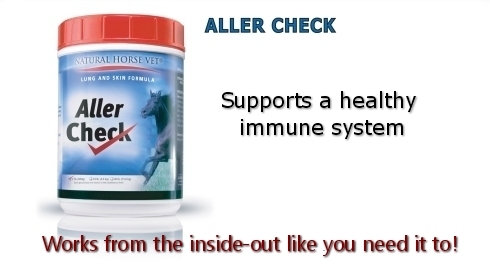 Our Aller Check is the best formula for helping maintain a balanced immune system that money can buy! Give at the rate of 1 scoop daily for the first 14 days, then give at the rate of 1/2 to 2 scoops daily, depending upon condition of horse. Typical maintenance is a 1/2 scoop daily for a 1000 lb. horse. One scoop (provided) equals 1 oz. Ascorbic Acid, Beta Carotene, Citrus Bioflavinoids, Deglycyrrhized Licorice Powder, Diatomaceous Earth, DL-Methionine, Garlic Powder, Ginko Biloba, Dried Ground Grape & Seed Pomace*, L-Lysine, Maltodextrin, MSM, N-acetyl-L-cysteine, Pine Bark Extract, Quercitin, Selenium Yeast Culture, Siberian Ginseng, Vitamin E Supplement, Yeast Culture. "For support from what is happening within- Aller Check is a product not to be without!"